The non-gaming Doubletree By Hilton Las Vegas Airport hotel is conveniently located two miles / 3.2 km south of McCarran Airport, and two miles / 3.2 km east of I-15 at I-215 and Warm Springs Road Exit 9. We provide a complimentary 24-hour courtesy shuttle to and from McCarran Airport drop-off at the MGM Grand on the Strip by complimentary scheduled courtesy shuttle from 8am to 10pm and complimentary scheduled courtesy shuttle to and from local businesses within one mile / 1.6 km. Situated southeast of the Las Vegas Strip, the Doubletree Club hotel is only minutes away from UNLV, Thomas and Mack Center and the Mandalay Bay convention Center. While staying with us at the Doubletree By Hilton Las Vegas Airport hotel, you can relax and unwind while saving money. You dont have to be a high roller to enjoy Complimentary wireless high-speed Internet access *Wi-Fi*, Complimentary standard laptop size in-room safe, No access fees on local, calling card or toll-free phone calls under 60 minutes, Complimentary 24-hour Doubletree Fitness by Precor Fitness Room, Complimentary printing service, Complimentary mini meeting rooms or personal work space. Whether you are traveling for business or pleasure, you can also enjoy at the Doubletree Club Las Vegas Airport hotel A heated outdoor pool, The Bakery Cafe - Where you can enjoy a breakfast buffet or pastries in the morning or a deli sandwich and soup in the afternoon/evening, In-Room Dining, 2,970 sq. ft. / 275 sq. m. of flexible and functional event space,eEvents Booking - Ideal for booking fewer than 25 guest rooms or for booking space for an all-day business meeting, reunion, wedding or other special event, On-site audio/visual rentals, Full-service catering, The Club Room which features A comfortable and relaxed setting, 24-hour self-serve business center with two computers, wired high-speed Internet access, printer with laptop connection, remote guestroom printing, Numerous telephones, Complimentary wireless HSIA.When it is time to see Vegas, know that you are centrally located to enjoy Shopping at The Forum Shops, The Grand Canal Shoppes, Fashion Island and Miracle Mile Shops, Dining at a variety of restaurants by legendary chefs like Wolfgang Puck, Emeril Lagasse, Charlie Palmer and Bobby Flay, Night life at numerous clubs such as Pure, The Bank, Tryst, Tao, Rain, Studio 54 and Margaritaville, Attractions like the Fremont Street Experience,Fountains of Bellagio, Lion Habitat and Shark Reef, Try your luck at one of the legendary Las Vegas Strip casinos. Experience lavish production shows, world famous performers and lounge shows, Play golf at an executive or championship golf course, some with breathtaking views, See the natural wonders like Lake Mead, Hoover Dam, Red Rock Canyon and Valley of Fire.As you can see, Las Vegas is much more than blackjack and slot machines. 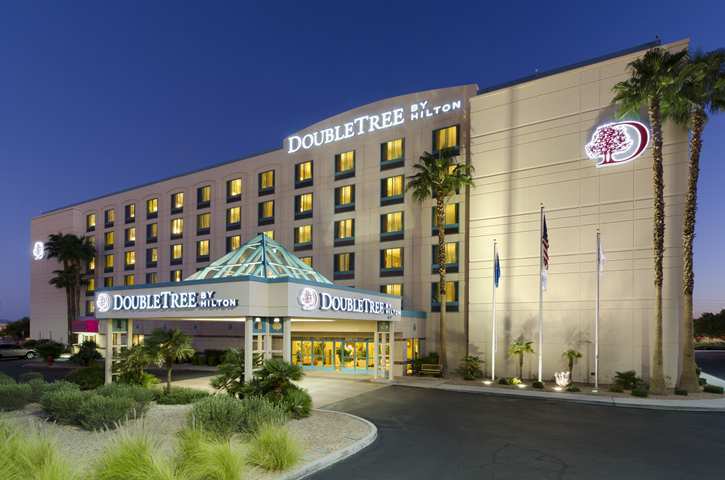 So work or play, make the Doubletree By Hilton Las Vegas Airport hotel your destination. Our professional and attentive team looks forward to meeting and welcoming you with our warm delicious chocolate chip cookie at check-in.